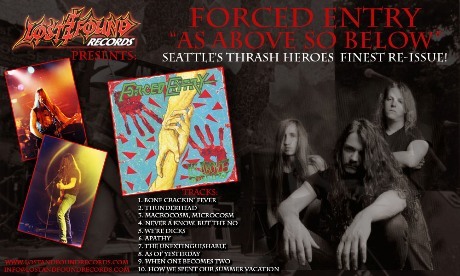 U.S.-based metal label Lost and Found Records has just reissued FORCED ENTRY's 1991 album "As Above, So Below". Originally released on the Relativity label, this title has been out of print for many years, drawing top dollar from collectors worldwide. Commented Lost and Found Records President Bryan J Anderson: "Lost and Found Records is pleased to add another rare title to our catalog. With the popularity of thrash surging again, this is a great time to get this gem back into print. With grunge coming on strong during the time of its release, this album never did get the exposure it deserved. It has been out of print way too long." The CD also contains new liner notes from Brad Hull. For more information, visit www.lostandfoundrecords.com.